India’s leading retailer Big Bazaar has just a while ago unveiled its plans to move up the value chain to become a Value Retailer. A new company has been floated under the brand name Future Hypermarket which will be the Discount retailing face of the group. It is not yet known how much stake Pantaloon Retail India will hold in the forthcoming venture. Although the new company is registered as Future Hypermarket, the branding could be changed. 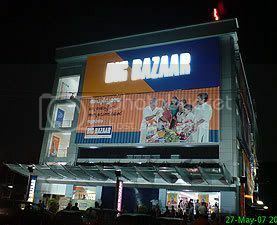 Big Bazaar is not a hypermarket and is more of value for money format and that is what the new company would stand for. There would be clarity for the concept as we become a separate company. There would be back-end efficiency in our operations. The company is also planning to relaunch its private label brands. The management is sending confusing signals as they have also launched Future Brands which is positioned to look after all the private label brands of the group. However, till now they have not cheated investors in the original retail holding company Pantaloon Retail India Ltd, unlike Reliance Anil Ambani group which created a vacuum in Reliance Energy by forming a new company Reliance Power and cheating original investors of Reliance Energy [BSES].